Using personal ID, keypad entry or HID proximity cards, access to this cabinet with one windowed door is limited to only those with authorization to open the cabinet. 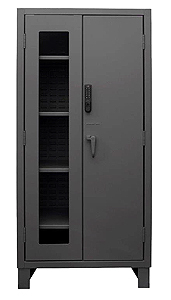 Constructed of heavy duty all welded 14 gauge steel, the cabinet has a 3-point latch mechanism with 3/8" diameter locking rods and cast steel handle. Handle has padlock capability as well. The electronic lock can store audit trails for up to 250 users and operates with 6 AA batteries. The lock records up to 1500 access attempts including date, time and user ID. Data downloadable to a computer using included software. 6" H legs allow forklift access, but have pre-drilled lag bolt holes for anchoring to floor. Finish is durable powder coat gray.